The North Milk and Milk Rivers originate in the foothills of the eastern slopes of the Rocky Mountains in Montana and flow northeasterly across the international boundary into Alberta. Downstream from the confluence of the North Milk and Milk Rivers, the Milk River flows eastward and roughly parallels the international boundary for about 120 river kilometres (70 miles) and then flows southeastward before it re-crosses the International Boundary into Montana and eventually empties into the Missouri River. The river flow is dependent on spring snowmelt and rainfall in the foothills and is thus less regular and dependable than the St. Mary River as a source of water. The United States St. Mary Canal was constructed in 1917 and is used to divert water through a series of syphons from the St. Mary River to the North Milk River for use in the lower Milk River valley in Montana. 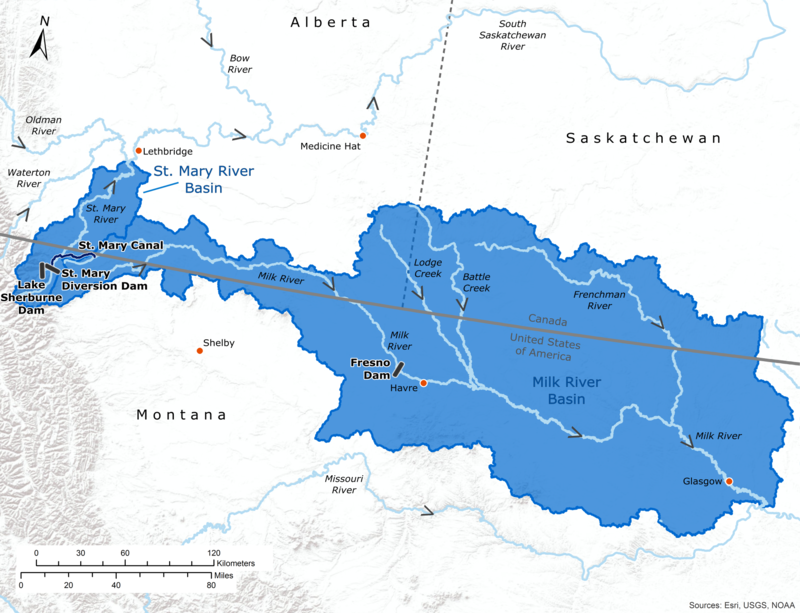 The IJC provides direction for the measurement and apportionment of water that crosses the international boundary in the St. Mary and Milk River basins, in accordance with the Boundary Waters Treaty of 1909 and the IJC Order of 1921. The Accredited Officers, appointed by the two governments, are responsible for the measurement and apportionment of waters of the St. Mary and Milk rivers in accordance with the IJC’s 1921 order.